Over the next few years Henry VIII commissioned other large ships, the most notable were the Mary Rose, Peter Pomegranate and Henry Grace-à-Dieu (“Henry Grace of God”). One thing Henry VIII did inherit from his father was a sound base of naval gunnery. Henry VII had employed French and Spanish gun-founders, and by 1496 they were producing wrought iron guns and iron shot. By 1511 Henry VIII had established a foundry at Hounditch, London, one of its principle tasks being to produce guns to arm his fleet. The Mary Rose was the first ship to carry guns on a gun deck with lidded gun ports marking a revolution in war ship design. 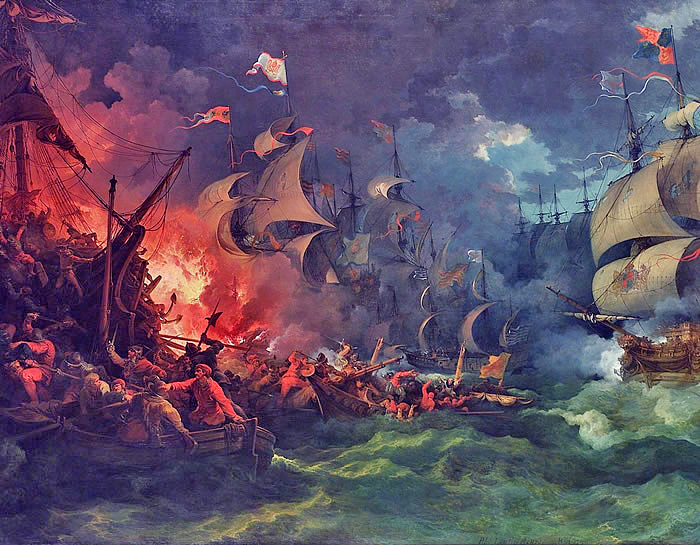 In 1512, England joined with Spain in an alliance against France mustering a fleet of 25 war ships. During the winter of 1512-13 provision was made to keep the ships victualed and the sailors paid marking the start of England’s standing fleet. Although during the reign of Edward VI and Mary I the Navy Royal was ignored and considered little more than a system of coastal defense, Elizabeth I made naval strength a high priority. It was during Elizabeth’s reign, in 1588, that England was involved in arguably one of the most famous navel actions; the defeat of the Spanish Armada. Elizabeth knowing of Spain’s intention to launch an invasion of England strengthened her Navy. She instructed Sir Francis Drake to launch a pre-emptive attack on the Spanish fleet at Cadiz capturing or destroying 24 Spanish ships. This action delayed the Armada for a year but this allowed Elizabeth to further strengthen her fleet and by 1588 the Lord Admiral, Lord Howard of Effingham, had 197 ships at his disposal. When the two fleets finally met at the Battle of Gravelines the Duke of Medina Sidonia only had 130 ships at his disposal, but only about 30 were properly armed warships. With its superior maneuverability, the English fleet provoked Spanish fire while staying out of range. The English then closed, firing repeated and damaging broadsides into the enemy ships. “I know I have the body of a weak and feeble woman; but I have the heart and stomach of a king – and of a King of England too, and think foul scorn that Parma or Spain, or any prince of Europe, should dare to invade the borders of my realm; to which, rather than any dishonour should grow by me, I myself will take up arms”. The defeat of the Armada helped solidify the Royal Navy as the most powerful and technically innovative Navy in the world which lasted up until the Second World War. After the Second World War the decline of the British Empire and the economic hardships in Britain at the time forced the reduction in the size and capability of the Royal Navy. The increasingly powerful U.S. Navy took on the former role of the Royal Navy as global naval power and police force of the sea. This entry was posted in Naval History, Tudor History and tagged Battle of Gravelines, Cadiz, Duke of Medina Sidonia, Henry VII, Henry VIII, James IV of Scotland, Mary Rose, Navy Royal, Royal Navy, Sir Francis Drake, Spanish Armada, The Anglo-Saxon Chronicle, Tilbury Speech by SliceOfHistory. Bookmark the permalink. Brilliant and informative!! Keep them coming! beautiful blog with nice informational content. this is a really interesting and informative post. good job! keep it up, hope to read your other updates. Thanks for a marvelous posting! I seriously enjoyed reading it, you will be a great author.I will remember to bookmark your blog. Continue your great writing, have a nice weekend!